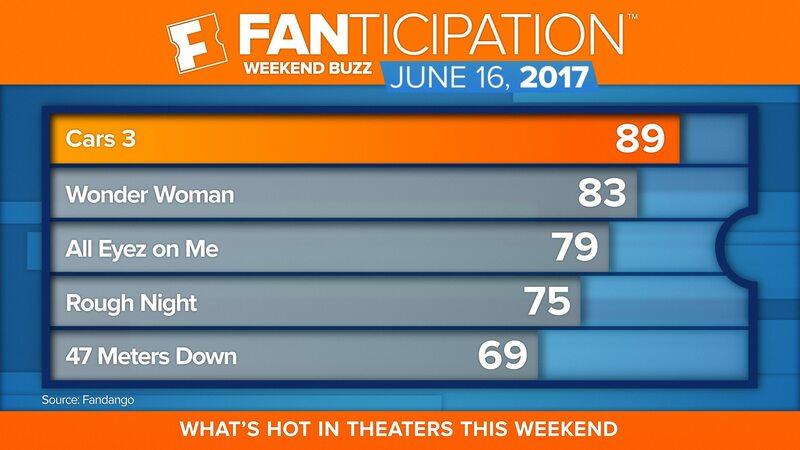 Los Angeles (June 15, 2017) – Disney/Pixar’s “Cars 3,” “Wonder Woman” and the new Tupac Shakur biopic, “All Eyez on Me,” are finishing at the top of Fandango’s weekend sales and Fanticipation movie buzz indicator with 89, 83 and 79 points, respectively, out of 100 points. 91% are looking forward to seeing Demetrius Shipp Jr.’s performance as Tupac. 86% are excited to hear the film’s soundtrack. 78% are Tupac Shakur fans.